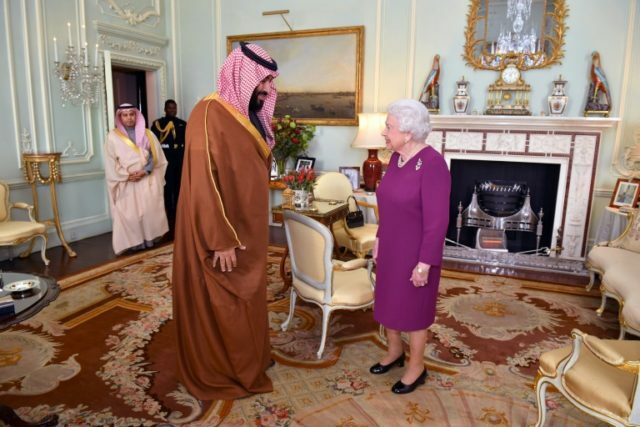 London (AFP) – Britain’s Queen Elizabeth II welcomed Saudi Crown Prince Mohammed bin Salman on Wednesday at the start of a controversial state visit, where he will face questions over his country’s involvement in the Yemen war. The crown prince lunched with the queen at Buckingham Palace ahead of talks with Prime Minister Theresa May, but was met with protests over the brutal Yemen conflict. May defended the invitation and Saudi’s involvement in Yemen when she was grilled in parliament over why Prince Mohammed was being afforded the red carpet treatment during his three-day visit. “The link with Saudi Arabia we have is historic, it is an important one and it has saved the lives of potentially hundreds of people in this country” due to anti-terrorism cooperation, she told MPs. The three-year conflict, which began with the Saudi-led intervention to fight Iran-backed Huthi rebels, has left 22.2 million people dependent on food aid, according to UN figures. The Save the Children charity protested the visit by installing a statue of a child near parliament “to draw attention to the violence that is being fuelled, in part, by British-made bombs”. Other demonstrators were planning to line outside Downing Street, where the crown prince will be welcomed by May for talks. Opposition Labour leader Jeremy Corbyn accused May’s government of “colluding” in war crimes by selling arms to Saudi Arabia, and even suggested that British military advisers were “directing the war”. May responded that her relationship with Prince Mohammed had already helped alleviate the humanitarian crisis by convincing him to ease Saudi blockades of ports in Yemen during a meeting in December. “This vindicates the engagement that we have with Saudi Arabia, to be able to sit down with them,” she said. Responding to an emergency question in parliament about the visit, junior foreign minister Alistair Burt defended Britain’s arms deals with Saudi, saying the regulations were “as strict as anywhere in the world”. He also praised the crown prince’s reform measures, saying: “The engagement of women in business and government makes a real difference. Downing Street earlier said it hopes the visit, part of the crown prince’s maiden foreign tour as heir to the throne, “will usher in a new era in bilateral relations”. His trips to Egypt, Britain and later the United States are aimed partly at courting investors, and follow a tumultuous period that saw a major military shake-up and a royal purge, part of a sweeping power play by the prince. After lunch with the Queen, he was due to jointly host with May the inaugural meeting of the UK-Saudi strategic partnership council, including ministers from both countries. The meeting will focus on support for reforms in Saudi Arabia, trade and investment relations and defence and security cooperation. In the evening, the heir-to-the-throne Prince Charles will hold a dinner for the crown prince with Prince William among the guests.